Like Murder on the Orient Express, only set on a plane, this is a very cool murder mystery where everyone’s a suspect. This is a fun thrill ride. the storyline about a terrorist in the skies is pretty straight forward. an air marshall receives a text, mid-flight, from a killer who is making threats. The killer says that he will murder a new person every twenty minutes unless a sum of money isn’t put into his account. the air marshall, bill marks, must now try multiple ways of figuring out who the killer is, while also preventing him from making good on his threat. the movie plays out like clue meets murder on the orient express. The killer is on board the plane, and there’s no escape. it’s just a matter of whether or not marks can find him. the result is a hell of a mystery, loaded up with suspects and twists. It works on a first viewing, as a movie that keeps you guessing and searching for clues. The result is a lot of fun. Non-stop is like a magic trick. it’s one of those movies where you watch it in thrill mode, studying every clue, and wanting desperately to know it’s secret. once you do learn it, however, you know that the movie and the experience of not knowing who to trust, will never be the same again. just like a magician telling you how his magic trick was done. you will never look at that trick the same way again. with this movie, where there is so much at stake, so many clues, and so many suspects, the not knowing element, and suspecting everyone, is the most fun part of the experience. the story here is about a murder on a plane. only it’s more than that. it’s actually about a terrorist on a plane who threatens the passengers by killing a new one every twenty minutes unless his demands are met. and the best part is, nobody knows who this killer is. it’s basically murder on the orient express set on a train. there’s no escape for the killer or the passengers, trapped in an aircraft thousands of feet above the ground, with air marshall bill marks (liam neeson) patrolling the skies. 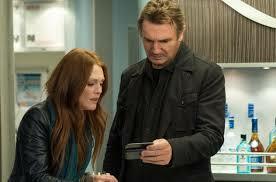 at this point, neeson turns out another movie or two just like this every year. it’s getting to where only one of every two movies he makes is actually good. some of the better ones, since he became the go-to action guy, are taken, unknown, the grey, and now non-stop. it bodes well that the same director made unknown and non-stop, clearly a man who knows how to handle a tricky plot that is loaded up with suspense and twists. the movie begins outside the airport with marks sitting in his car, pouring himself a drink. he then gets out of his car and stands outside the airport doors, having a cigarette. that’s when he is approached by a guy flying to amsterdam who wants a light and to have some friendly chit-chat. soon marks is heading through security, where he encounters another character on the line. and then it’s over to the gate, with him assessing everyone he sees, through blurry vision. it’s a cool opening five minutes because it takes you through every little part of going through the airport, including using the lavatory there. the blurry vision is due to mark’s drinking, but it also adds to the style of the film, giving him an almost robotic-like view of his surroundings, noticing the different people who will be passengers on the flight. it isn’t long before the threats start popping up on marks’ cell phone. somebody is out there, claiming to be one of the passengers, and saying that he will kill somebody on board the plane every twenty minutes unless one hundred fifty million dollars is transferred to a certain bank account. marks quickly springs into action, getting the other air marshal on board the plane to meet him in the back. things turn sour, and the two of them come to blows. it turns out there was more to this other air marshal than we knew. soon marks is trying every plan he can think of to flush the killer out. first it’s getting some help from people who will circle the passengers on a camera screen that are using their cell phones, right at the moment when marks texts the killer. when that doesn’t work, the next idea is to upload a virus onto the killer’s phone that will make a ringing sound when marks sends him a photo. once the sound goes off, marks will know who the killer is. none of these ideas work out. the stakes get raised more and more as the film goes on. it gets so crazy that nearly everyone is a suspect. at one point he suspects the copilot, the flight attendant, jen summers, and a whole ton of passengers. all the while people keep dying and it’s usually in a pretty interesting way. every death has meaning here, and advances the plot forward. that helps the movie stay interesting. what also helps is that marks gets framed for what’s going on himself, with the account he provided to airline security officials on the ground, being said to be put in his own name. at one point we even get a line coming over the phone to him that goes something like, “everyone on that plane checked out and is supposed to be there, except for you.” kind of reminds me of that line from the end of arlington road. the ending of the movie is the only part that feels a little forced. unfortunately that’s the worst time to have a problem. who the killer is turns out to be is pretty cool, but then we have to get the usual speeches about why he’s doing this, and what his cause is all about, and it would have been better to just keep it simple and make it about money. on top of that, what’s with the outfit changes of the bad guy? luckily these are small problems, and there’s plenty of action still to come in the closing moments of the film. 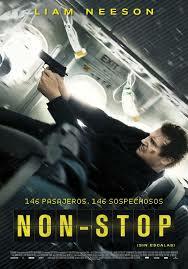 non-stop is certainly a movie that is more fun than it is smart, but as a mystery and thriller it definitely works.